I met an old friend out in the desert today. It was nice seeing the Mojave green rattlesnake again since I hadn’t seen one for a couple of years. I didn’t even notice it at first. I was walking down the middle of a sandy path, minding my own business, when a hiss and a whirring rattle startled me. I stopped, looked around, and there it was, about eight feet away, sunning itself beyond the shadows of a creosote bush. I edged away f rom the rattler, and it inched away from me, back into the protection of the bush. And then I continued my walk, a smile on my face. I don’t know why such encounters make me feel good, perhaps because it’s nice to know that there is a wild heart still beating beneath the calm veneer of the desert. I also got to rediscover the truth: I am not afraid of snakes, just healthily wary, and rightly so. 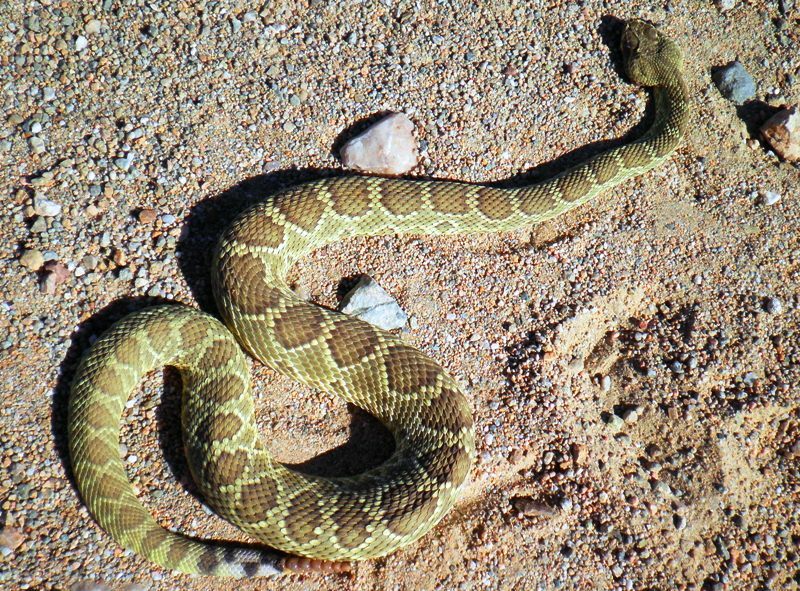 The Mojave green rattlesnake will not attack, but if disturbed or cornered, they will defend themselves. Apparently, bites occur if people accidentally step on a snake or purposely harass it, so if people are careful, they can keep from being bit. I know people who will run down snakes if they see them in the road, and sometimes they even go hunting for them on the assumption that the only good snakes are dead snakes. The only time that makes sense to me is if the snakes leave the wilds of the desert for the tames of our neighborhoods, but that doesn’t happen very often. Nor does it happen very often that I get to see such a fearsome creature, so meeting up with it has made my day. A lovely picture, Pat, and an evocative rumination on snakes and our relationship with them. It’s a kind of mantra–do your own thing and leave the snake to do his/hers. “Human” behavior often isn’t very humane. People go out of their way to run down all sorts of critters who are crossing roads. Thanks for sharing. It’s a good mantra. I used to see snakes in the road and felt bad that they were too slow to outrun a car, and then I found out about people doing it on purpose. Turns my stomach. I don’t mind snakes but also know better than to try to pick one up. It is spiders that scare the hell out of me. For my money there should be more lizards and less spiders in this world. Lizards are my daily companions on my walk. Yes! More lizards!